As a cross country rider I’ve long since come to terms with climbing. I may even enjoy it in a masochistic type of way. But the real reason most of us enjoy climbing, the real payoff, comes after the fact… When gravity turns from your foe, to your ally. I appreciate the balance that climbing everything I descend offers, but there are times when you just want to point your wheel down the hill and let ‘er rip… To constantly feel the wind in your hair, weaving between rocks, roots and singletrack in search of the best flow. It’s the appreciation of these things that got me so excited to work with two friends of mine and help realize a dream of theirs. Andrew Ellis has been mucking around with bikes since he was a wee tot back in England, but he’s always had a dream of sharing his love of riding two wheels downhill with as many people as possible. On and off over the past year, I helped him pull a website together for their new downhill touring company – Descend Inc.
Generally speaking, I’m very lucky to really enjoy my ‘day’ job, but I have to admit, it was a real treat to combine my day job and my post-work passion into something special. 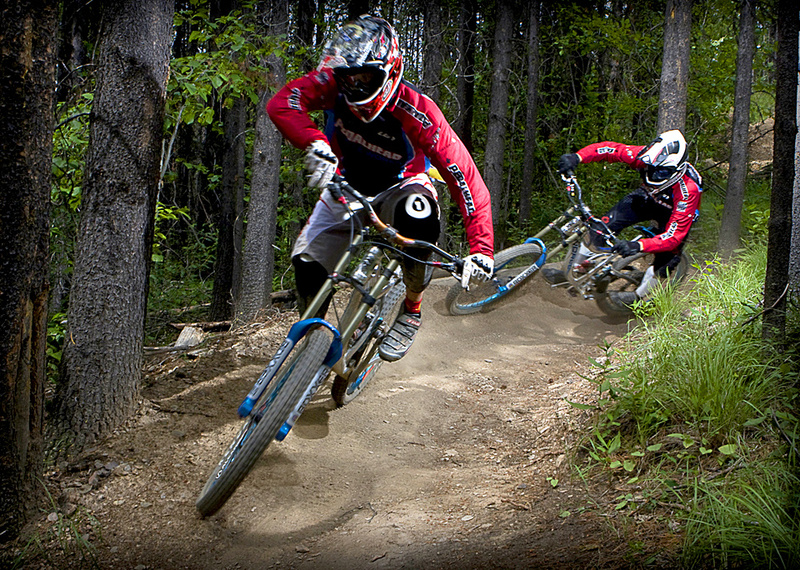 Specializing in mid-size private tours of Panorama, Kicking Horse or Mount 7, as well as shuttle tours in Golden, Descend is all about capturing the challenge and chill of downhilling. Once you cough over a wee bit of cash (very reasonable amounts by my estimation), you’re effectively set – and outside of a few logistics, almost every aspect of your trip is taken care of. Cozy mountain cabin to crash in after driving yourself to near exhaustion on the hill? Check. 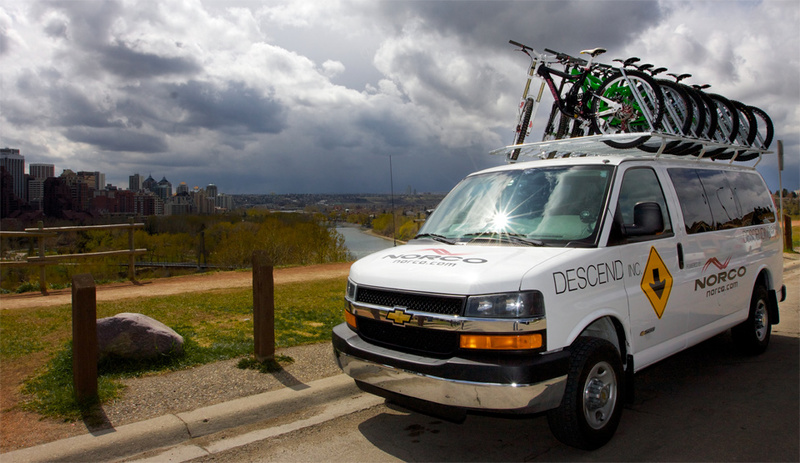 Spacious, kick-assed Descend-mobile van? Check. Wicked bikes with more travel than 3 xc rigs combined? Check. Delicious, home-made food to get you fueled up for the next day? Check. A sharp, witty bloke to guide you down the narrows? Double check. Sharing a pint with Andrew a few weeks ago, we got to chatting about how specifically a cross country rider could really benefit from a trip like this. He was a firm believer that not only would a trip with Descend would not only be a nice break from a hectic race season (or a nice way to wrap one up), but would also be a fantastic way for a cross-country focussed rider to get quite a bit faster. At first blush this may not make sense at all, especially since most races to date have been in/around Edmonton, where the terrain, though winding, technical, challenging and fun, doesn’t really provide any serious altitude problems. Anybody who has raced a course with sustained climbs/descents however, will instantly recognize the value competent descending can bring to your game. At best, you’ll shave a fair bit off your times, gain a ton of confidence, and school your buddies in rough, technical descents – at worst you’ll work the kinks out of your downhill game and go a long way to avoiding a bad crash on your way down the mountain. So with race season in full swing, maybe it’s time to carve out some time and point the wheels south and get some quality time with gravity! Here, here! I can attest to the benefit of downhilling skills when you’re an XC racer. All last year, my strength was the climbs, while my downhilling ability was ‘okay’ I’d often just get caught by anyone I’d managed to gap on the climb. This was frustrationg to say the least. I’ve been working on it this season though, and hope I’ve come a long way. That said, I’m sure I’d be a total disaster compared to Andrew and crew ;-) We should set up a trip! @jooles Yeah, a tougher course definitely demands more of the rider – I noticed the same thing at last years Bow80 – a true suffer fest… Many of the men & women were having to rest and were intermittently walking sections on the descent. Having more confidence on descents would definitely make getting down a lot easier, safer and more efficient. I was terrible on the downhills but more than terrible on the uphills. Lots of work to do. I will admit, that the only real thing Edmonton is missing is the sustained climbs/descends, most of what you’ll find in the valley is equally as challenging as what you’ll find in the mountains… Maybe just a few less rocks & boulders! Hopefully we can hook up a little later this season (when I’m in Edmonton) and tear it up out there!